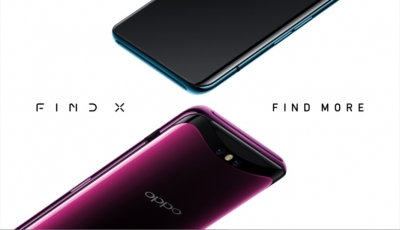 New Delhi July 12 (IANS) Chinese smartphone maker OPPO on Thursday launched its flagship smartphone "Find X" in India for Rs 59 990. It has the world s first stealth 3D cameras with Artificial Intelligence (AI) infused into it and a sliding structure that nearly mirrors the way a semi-DSLR camera works. The new stealth design includes a flood illuminator an infrared camera a ranging sensor a receiver a front camera a dot projector and a rear dual-camera. With the sliding structure of the camera the whole system automatically stretches out when unlocked or when a user is taking photos. It will retract if it is not in use. The pre-order for the 8GB RAM and 256GB internal storage device will begin on Flipkart on July 30 and the smartphone will be available from August 3. "The Find series represents OPPO s innovative spirit that believes that a smartphone isn t just a communication tool but also a piece of art " said Charles Wong OPPO s Assistant Vice President and OPPO India President.
" Find X aims to offer our Indian consumers a premium innovative and technologically advanced offering for an advanced smartphone experience " added Wong who is responsible for building the company s momentum in the domestic market. The dual-SIM device available in Bordeaux Red and Glacier Blue variants houses Qualcomm Snapdragon 845 -- the most powerful CPU ever for a higher performance. With 3730mAH battery the device claims to run full-day with optimum usage. It sports a 6.42-inch panoramic arc screen with a much wider "19.5:9 aspect ratio". It also sports 3D structured light facial recognition technology to unlock the phone in an instant. The smartphone houses a 25MP AI-enhanced front camera with "3D AI Beauty Technology" that enhances the accuracy of facial recognition with 296 facial feature points along with the 16MP+20MP rear dual camera system. The "Find X" is outfitted with the latest Google Assistant activated with the voice command "OK Google " for voice assistance to find information schedule make phone calls play music listen to weather forecasts and find locations. The company also announced a special edition "FIND X Automobili Lamborghini Edition" that was launched globally as a part of its global strategic partnership with Automobili Lamborghini S.p.A. ("Lamborghini"). The "Find X Automobili Lamborghini Edition" supports SuperVOOC "Flash Charge" technology and enables full charge in 35 minutes has Qualcomm Snapdragon 845 mobile platform and a massive 8GB RAM and 512GB memory combination.